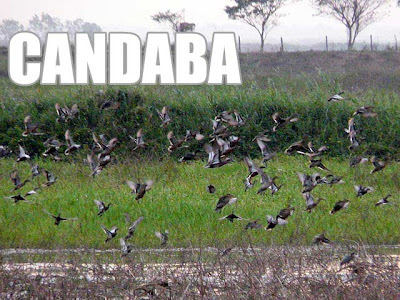 Birdwatching at the Candaba Bird Santuary has always been in my wish list. But to really appreciate the visit, you have to be with expert birders. 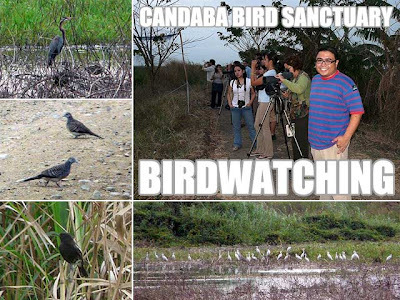 And since it was a "weekend of everything that flies," we visited the Candaba Bird Sanctuary to do some birding! To make sure the experience was even more enriching, we tagged along members of the Wild Bird Club of the Philippines (WBCP) together with their equipment to guide all of us around the place. 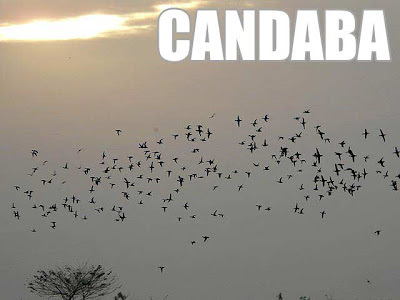 It was Birdwatching 101 for all of us. They introduced us to the different species of birds found at the reserve area in Simang, Candaba which is actually the property of the mayor. And with the special spotting scopes brought in by the club, we were able to see and appreciate the birds "up close." I'm definitely going back! The only downside is when there are big groups, especially media groups, the local "managers" of the place would fire shots in the air to startle the birds so that they would put up a show for visitors. Great for photos but bad for the birds! Media is to blame here since the photographers don't care if the birds get disturbed so long as they get a good shot for the papers. So those wonderful pictures you see in the newspapers most probably are a result of guns fired in the air, no thanks to impatient photographers who can't wait for the birds to do it naturally and at their own pace. Several shots were fired while we were there to the dismay of the WBCP members who were guiding us. Anyway, to get there, it's advisable to exit at Pulilan since the roads are better. Make your way to the Baliuag (you'll pass by SM City Baliuag), and make a left under the flyover. You make a right when you see the Barangay Hall of Bahay Pari, Candaba. Below is a video I took while we were there. I didn't know we now have groups active in birdwatching. What exactly are they looking for when they bird watch? Just curious. that part about firing guns into the air, that's just barbaric and crude. can't support that kind of behavior. @bertN, birdwatchers look for as many species as they can. With a spotting scope, you can appreciate even the minutest of details such as plumage and color. The more species they've seen with their two eyes, the more the bragging rights within the birding community. It's that excitement that keeps them looking around for the birds. @Pam, I'm fine with my point-and-shoot. Hehe!